Gideon Sackitey (Ghana) had been looking forward to working abroad. "Out of the blue came this wonderful opportunity to volunteer in South Sudan – a nation with a chequered history, but with such huge potential," he says. A few months into his assignment, he shares his first impressions, also of his first celebrations of International Volunteer Day. 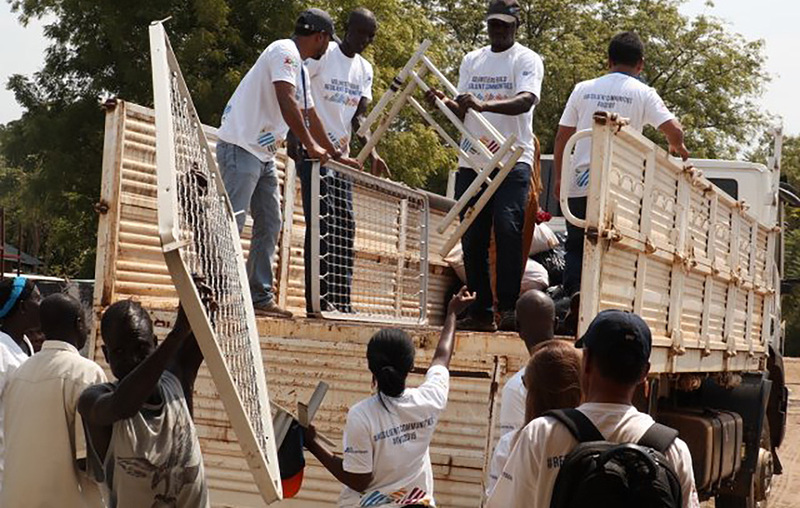 UN Volunteers in South Sudan celebrate IVD 2018. Among them, Gideon Sackitey (centre, right) helps colleagues to offload mattresses – part of the items they donated to the children's ward at Bor Town Hospital in South Sudan. I left Accra on the 17th of October 2018 and arrived in Juba the next day, on the 18th. It was my first mission and first time in South Sudan. I had no clue what kind of environment I was coming to, except that there was a peacekeeping mission in place and that the place was baking hot! Coming down the Kenya Airways flight, I was overtaken by the heat first which stood at close to 37 degrees Celsius that Thursday afternoon. I would soon have to adapt to this. A week and a half later, after induction and a near one-hour helicopter flight – my first – I was finally in Bor, in South Sudan’s Jonglei region. This would be my duty station. It was not exactly what I expected, I must confess. But my training and experience makes me adjustable to any condition, and Bor promised to be one. On the job, my expectations were high. I had been a journalist and communications specialist for almost two decades. I was close to news reports of countries and children in conflict situations, and seeing volunteers on the ground providing comfort and hope. And in many instances, change finally came through. This time it was me, on the ground to volunteer my expertise; leading the field Public Information team to communicate the Mandate of the UN Mission: protection of civilians; monitoring and investigating human rights; creating conditions for the delivery of humanitarian assistance, and supporting the implementation of the peace agreement. Not too long after, the International Volunteers Day 2018, celebrated every 5th of December, was beckoning. I started wondering what it was all about. Then preparatory meetings started, and to my surprise, colleagues asked that I lead volunteers in Bor to steer the preparatory team. My first reaction was, "You guys have never met me, don’t know me; I wonder why you’re choosing me!” But they wouldn’t budge. I still don’t know why they chose me, but then volunteering means offering to lead, too. So, somehow, I agreed, and preparations started. "What are we going to do?" we asked ourselves. After a few minutes we agreed to donate some items to the Bor Town hospital. But that was too big. So, we chose the children's hospital. Reason? Because children are the most delicate members of any society, and volunteering to help them was contributing to the future of the state. But I was a bit worried. I had been following events on twitter, especially of what the day was to be and what was expected, and realized our event was rather small and low-key in character, compared to what other volunteers were doing. "It is the act. It is the spirit behind it that matters," Alieu Jammeh, a UN volunteer said, virtually convincing us all that it was not some big deed. And then, 5 December 2018 was here! The three words – International Volunteers Day – were everywhere on the internet. On social media, the hashtag #IVD2018 was trending. By this time, what the day stood for had sunk in: I had come to understand that it was the day set aside for volunteers to reach out to the communities and celebrate the work they do. The United Nations Volunteers (UNV) programme had chosen the day this year with the theme: 'Volunteers Build Resilient Communities'. For us, UN Volunteers in Bor town, it was the culmination of several actions that saw us presenting items to the children’s ward at the Bor Town Hospital: more than 100 blankets; 10 buckets; 45 mattresses; 43 beds; a carton of baby Cerelac; six large size Infant Milk formula; cutlasses; several sweeping brushes, and rubber boots for hospital staff. The Acting Director of Bor State Hospital Dr. Moses Gak was more than excited as he joined the volunteers to unload the truck with the items. "We are very glad for this donation as it would give us some real relief," he said, recounting the challenges he faces in the task of providing health care to his patients. "Most of the beds in the wards are broken," said the doctor, his words getting drowned by the overwhelming feeling of joy. I still think we could have given more; done more. The fact is we could, but as one volunteer, Marzia Guadalupi put it: "We have another opportunity to find the need and fulfil it". Indeed, for us, as it was for other volunteers, it was an opportunity to build strong, viable and sustainable communities across the world. I am smiling now, as I look forward to 5 December 2019, to celebrate volunteering again.